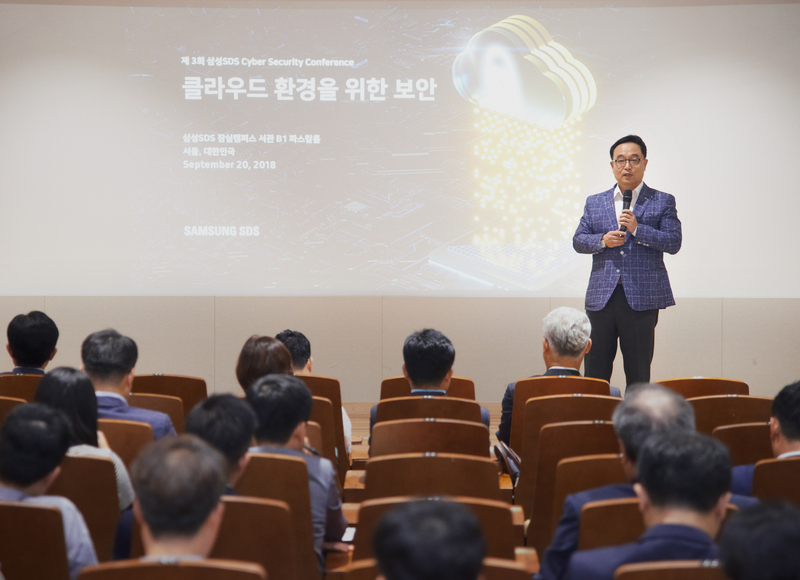 On the 20th, Samsung SDS (CEO Won-pyo Hong, www.samsungsds.com) held the 2018 Cyber Security Conference at their Jamsil Campus in Korea, SDS global headquarter and announced it would reinforce its cloud security service business. At the conference attended by enterprise information security business CEOs, Samsung SDS introduced various platform-based cloud security solutions: a cloud security monitoring & control service; an integrated authentication service for cloud computing; a cloud-based security software service (SECaaS: SECurity as a Service); and encryption technologies for cloud computing. The cloud security monitoring & control service allows users to handle various cloud hacking threats with a web-hacking detection model based on machine learning algorithms and threat intelligence that Samsung SDS has accumulated for the past 20 years. The cloud-based integrated authentication service combines user authentication, account management and anomaly detection to allow users to securely and conveniently use SaaS (Software as a Service) as well as their own systems with a single login. SECaaS offers cloud-based security software including firewall, anti-DDoS and malicious code detection. Combined with Samsung SDS’ security monitoring & control service, SECaaS enables users to use cloud services more safely. In addition, Samsung SDS introduced two more technologies: cloud DB encryption, and machine learning based on fully homomorphic encryption. The former prevents cloud encryption key hacking and allows efficient operation with an integrated management system; while the latter directly analyzes encrypted data without decoding, preventing personal data breach. Ho Kim, Samsung SDS Cloud Business Division Leader (Executive Vice President) delivers welcoming remarks. “We will keep expanding our security service lineup by applying new technologies, with an aim of reinforcing our cloud security service business,” stressed Samsung SDS Cloud Business Division Leader and Executive Vice President, Ho Kim.